As an omen for the upcoming Raptors season, the injury to our beloved mascot set an unfortunately ominous tone. It was a shocking enough event that I had to go looking for a deeper karmic meaning; the Raptor injury as franchise metaphor. I think it has to rank ahead of the Manu’s meeting with a bat but below the Heat fans leaving the arena before the end of regulation in Game 6 of last year’s Finals. The Manu highlight shows a Spur unafraid, responding calmly and practically to the situation at hand. It sums up the team. Meanwhile, while the frontrunning Heat fans are a scourge, at least they have something significant to feel heartbroken about (even if the team eventually won). The Raptor: let’s shed some Internet tears. We, the Raptors fans, are already moaning about the season. The Raptor injury all but guaranteed that. We haven’t even played game one but just as the Raptor went down in a heap, so too does it feel like the season’s end is preordained. With that in mind – and the usual clueless hope returning – let’s forget about the recent past, deal with the present and hopefully look to the future. Next week, the Raptors take the court for their first game of the 2013-2014 season. As with last year, there is optimism in some (deranged) quarters that the team could theoretically fight for the Conference’s eighth seed (to presumably meet the Lebron James buzzsaw). Of course, there are other options. The present Raptors team has a couple of bright lights, it has some cheery youthful vigour, and maybe, just maybe, a desirable path to greater success. So, let’s break down the three main options (with the help of some choice sci-fi movie quotes) for the benefit of Raptors fans everywhere. They need a pick-me-up and a little more belief in the days ahead. Well, I know I do. Having already started asking Rudy Gay, the prime nuke target, about losing this season, it feels like tanking is very much on the minds of the people and press surrounding the team. Did you know that the Raptors are sixth (that is 6, six out of 30. Six! How many different ways can I write this?) in team payroll this season? For a team coming off of a 34 win season this actually hurts to write. The prime destroyer of the cap is, of course, Rudy Gay who is in for a player option next year at a whopping 19 million dollars. I wonder if he’ll pick up that option (spoiler: YES HE WILL). So then, here’s the thinking: the Raptors as currently constructed have no hope of getting beyond, say, the 7th seed in the Eastern Conference. That is a date with annihilation at the hands of the Bulls or Pacers (and if they make it to 8th: Heat death). This draft class is apparently loaded (with Andrew Wiggins, Jabari Parker, Marcus Smart, Dante Exum, etc.) poised to enter the league next year. As many are asking of GM Masai Ujiri, why not dump Gay and his absurd contract that fixes you to, at best, a first round exist, let Kyle Lowry walk (I’ll miss his intensity, if not his shooting), launch Landry Fields into orbit (wait, we can’t do that?) and get a top five pick in next year’s draft. Then, build around the alluring Jonas Valanciunas, Terrance Ross and Amir Johnson core and hope that DeMar DeRozan plays well enough to justify paying him 10 million a year. Does that team get you out of the first round? No, no it does not. But we can at least pretend! For the record: I think some combination of these events will occur this season. This is the far more unlikely option, despite even Ujiri’s skills at the trading game in the NBA. It has to be discussed because remember this is a man who somehow found a way to move Andrea Bargnani, while taking back some draft picks and a semi-useful shooter (Steve Novak). Small victories. Assuming we believe that Rudy Gay’s recent laser eye surgery worked and he becomes a proficient shooter, why not keep him and try to swing some deals to fill out the bench. Or maybe you deal Gay and assets to try to snag Rajon Rondo (definitely on the trade block) or do-it-all forward Paul Millsap, signed to a reasonable short term deal. I hesitate to look too deeply into this option because trading the team’s draft picks is what lead us down this dead end in the first place. I mean, I like Kyle Lowry but where do we go with him now? The stand fast option works if you’ve got a core identity and star player and are missing only a piece or two to make serious progress in the playoffs. The Sixers and Hawks, to mention two teams, had enough of being middling teams and are in the process (or well on their way, as with the Sixers) of revamping and reinventing their teams. The Raptors, bless them, had a chance to do that a few years ago when they sat on the draft pick that became Roy Hibbert. They decided to include it in a trade for Jermaine O’Neal. The Raptors may have won a few more battles but the war they ultimately lost? Incalculable. Look upward and onward young men. We believe! This way hope abounds! Did you know that the Lowry-DeRozan-Gay-Johnson-Valancuinas lineup was actually a wrecker last season in the scant few hundred minutes it played together? Is it crazy to buy into those small sample size numbers and get reckless with optimism? Maybe we just need to believe in this admittedly skilled and sizable lineup (I’ll look the other way on the lack of outside shooting if you will, deal?). Hey, JV had a monster time in the Summer League, and DeRozan can’t even walk down the street in the LA area. Maybe Terrence Ross is ready to be a great sixth man sharpshooter/extreme dunker this season. And while signing the dregs of the Indiana Pacers bench (D.J. Augustin, Tyler Hansbrough) was probably not the overly wisest move, at least those guys have some big game experience. Plus, Hansbrough appears to be completely unflappable in the face of every obstacle (except Metta World Peace). Yes, I’m actually OK with cheering on Hansbrough. See how easy it was to talk me into all that? 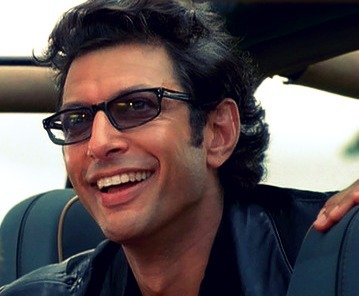 What was it that Dr. Ian Malcolm said? Yes, there it is. Maybe the answer to the Raptors’ problems can be found in the original inspiration for the team brand after all. The Toronto Raptors 2013-14 season in a single elongated quote from master thespian Jeff Goldblum. 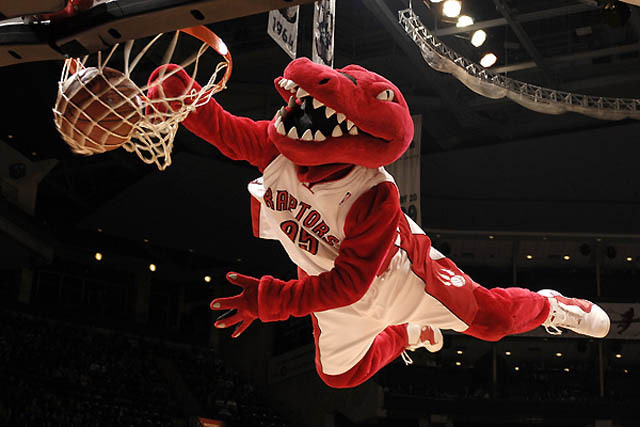 I guess what I’m saying is, I hope the Raptor mascot makes it back alright. they might go for option 3 and aim for 7th and I would not be surprised. at all.